Eliminates driver's time and effort dealing with a padlock on frequent deliveries. 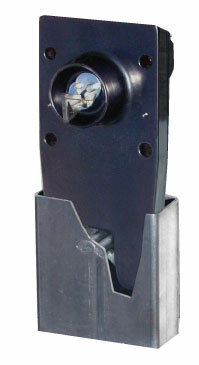 Our patented Roll-Up Door Lock simply locks when the door is closed. Designed specifically to eliminate the time and effort needed to deal with a padlock and hasp system, which invites not locking the door at all on a busy delivery schedule. The unit is permanently installed to the door not to interfere with cargo handling. When the door is closed the interior jaws spring open to close around the carbon steel pins in the base that is welded to the floor. Each assembly comes with simple installation instructions.